In Elijah’s four decades of life, no one had ever preached to him about Jesus. Editor’s note: Adventist Mission is only identifying Elijah by his first name and is not disclosing his whereabouts to protect his life in a place where people who leave his religion for Christianity face physical attacks and sometimes death. Careful study of the Bible has led many people to join the Seventh-day Adventist Church in East Africa. Elijah, however, became an Adventist after carefully studying the holy book of his non-Christian world religion. Elijah, who grew up in a devout non-Christian family, excelled in his studies in East Africa. He made his religion the centerpiece of his lifework and earned related degrees at universities in three Middle East countries. He rose in prominence as a national religious leader and, among his responsibilities, oversaw missionary outreach for his religion in his homeland. But questions rose in his mind when he joined a scholarly field trip to Italy. In Rome, he saw inscriptions on houses that declared God had commanded people to rest on the Sabbath. From the Bible, he understood that the Sabbath was on Saturday. But in Rome, he saw shops close and people go to church on Sunday. Something else puzzled Elijah. In Italy, he visited ancient sites where people had been baptized by immersion, as Jesus was in the Jordan River. But he and other visiting scholars were told that baptisms nowadays were conducted by sprinkling water on people’s heads. He couldn’t find instructions to baptize this way in the Bible. In Elijah’s four decades of life, no one had ever preached to him about Jesus. He only had learned that Jesus was a great prophet but otherwise a normal man. Now in his holy book, he read verses describing the deity of Jesus, His death, His power at Creation, and His earthly miracles. In chapter 3, verses 45 and 46, he read startling words that impressed him that Jesus is, in fact, God. Elijah’s mind was made up. He would worship Jesus. As Elijah looked for a church where he could learn more about Jesus, he remembered seeing public street discussions — called dialogues — where leaders from his non-Christian world religion compared their beliefs with those of Christian preachers, including Adventists. “More than any other denomination, the Adventists challenged my people about Jesus’ divinity,” he said. So, on a Saturday, he went to an Adventist church. Within days, Elijah had to flee to another city with his wife and their young children. Relatives had learned about his interest in Christianity and threatened to kill him. On the first Sabbath in the new city, Elijah and his wife showed up in an Adventist church just in time for the start of a two-week evangelistic series led by Alain Coralie, executive secretary of the Adventist Church’s East-Central Africa Division. At the end of the meetings, Elijah and his wife, Josephine, were baptized by immersion. 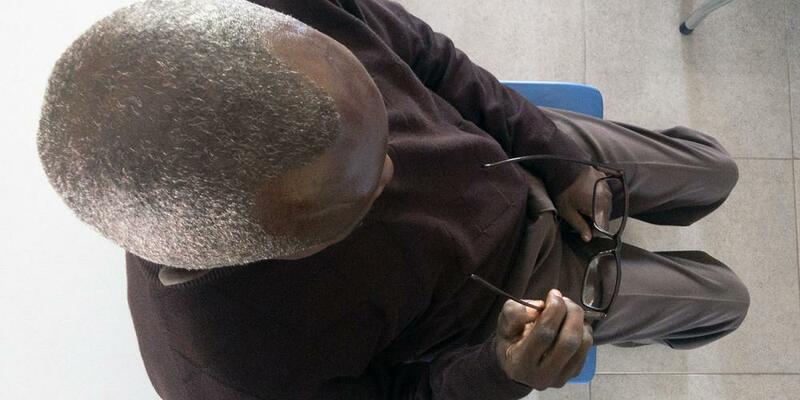 Today, Elijah is 50 and eagerly sharing Jesus’ salvation with those who haven’t heard of Him. Many people have been baptized through his evangelistic meetings and his work as a literature evangelist. He also serves as a church deacon. Some people might say that Elijah’s conversion came at a high cost. But Elijah wouldn’t change a thing. 25 Baptized in Exchange for a Leg Phylis Odindo is joyful despite the loss of her leg. Missing Ingredient Caring for the community in Laos, building bridges to our Buddhist friends, and bringing health and healing to Lahore a mega city in Pakistan.